Campbell University’s Jerry M. Wallace School of Osteopathic Medicine launched its Opioid Abuse and Drug Abuse Curriculum in January in response to the nation’s epidemic that kills an average of 78 Americans each day. North Carolina is home to four of the Top 20 cities in the United States for highest rate of opioid abuse — No. 1 Wilmington, No. 5 Hickory, No. 12 Jacksonville and No. 18 Fayetteville — according to a 2016 study by Castlight Health Inc., a nonprofit health care information company. In 2015 alone, prescription opioids like hydrocodone (used by doctors to treat pain) and illicit drugs like heroin and illegally manufactured pills claimed more than 1,200 lives in North Carolina — a 400-percent increase from 15 years earlier. A March 2016 survey by the National Safety Council revealed that 99 percent of the nation’s doctors prescribe highly addictive painkillers to their patients for longer than the three-day period recommended by the Centers for Disease Control and Prevention. Nearly a fourth of those doctors say they routinely prescribe at least a month’s worth of opioids. That’s more than enough time for addiction to grab hold. 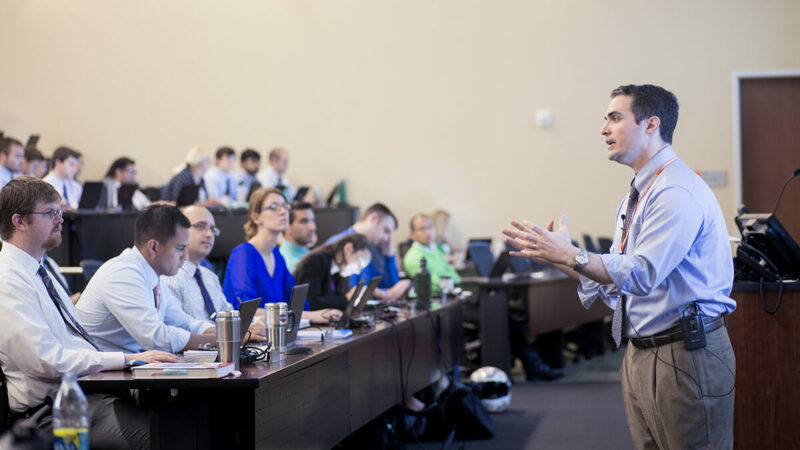 Under the direction of Dr. Jim Powers, associate dean for clinical integration and professor of emergency medicine, Campbell Med’s opioid curriculum is designed to educate the next generation of physicians on both the dangers and benefits of opioids and alternative treatments for pain management. The curriculum provides “practical guidance in screening pain patients for substance abuse disorder” and will help future doctors identify when patients are abusing their medications. “Studies have shown that even brief interventions by primary care providers have proven effective in reducing or eliminating substance abuse by people who abuse drugs but are not yet addicted to them,” said Powers. Campbell’s medical school, which graduates its first class of doctors in May, and its College of Pharmacy & Health Sciences are among the nation’s schools actively changing the way we treat pain and prescribe pain medication in this country. Many Campbell graduates currently serve or will practice in some of our state’s and region’s most medically underserved areas.